How do I know if I’m the right candidate for an All-on-4 treatment? The All-on-4 treatment is usually recommended for people who wear dentures or who will have to wear them in the near future, almost anyone is apt for an All-on-4, nevertheless your health professional has the final say on your eligibility depending on your health and particular needs. Will the all-in-4 feel and look like natural teeth? Yes!, you won’t be able to feel the difference, one of the great benefits of the All-on-4 treatment is that you can eat food like pop-corn or hard candy without worrying after fracturing your denture, or having to clean it up afterwards, as for how they look, people will compliment on your white-pearl smile, they might even say you look younger. The dentures are usually undistinguishable from regular teeth and the implants are covered by the gums and the denture itself. What’s the aftercare like?, is it easy to clean? For the first few days you might be asked to avoid certain foods and take some medicine in case of discomfort. But just like natural teeth, All-on-4s just need daily brushing and flossing, the dentist may give you further instructions depending on your particular needs. Just keep in mind that the success rate of All-on-4 is over 98% as long as you maintain a good hygiene. How long do I have to wait for my new teeth? The surgery itself lasts a couple of hours per arch; a temporary denture is affixed to the implant on that same day, so you get a shiny new smile as soon as the surgery in finished. The final denture may take up to a month, but once it’s ready the dentist can install it in an hour or so. Can I get an All-on-4 on the bottom arch? 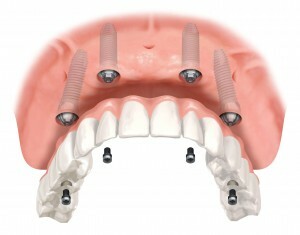 Yes, one of the benefits of the All-on-4 is that it can be used either on the top or bottom arch, even on both, in such cases, some dentists might recommend that you get them done at the same time, as that will reduce the cost, and you won’t have to go through two different recovery periods, of course, that depends on your personal budget and needs. What are some of the benefits of an All-on-4? First, it’s a perfect procedure for people who have suffered from small bone loss as you won’t need bone grafting. Second, since it requires fewer implants than more traditional procedures, the process is quicker, safer, and the recovery time is lower, and finally, for a full-mouth replacement is a very affordable procedure.